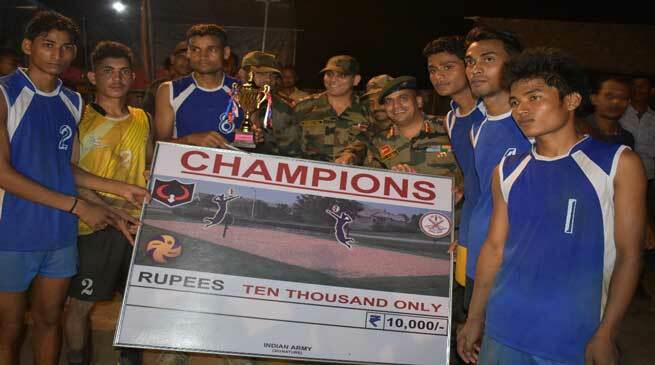 Nalbari Volleyball Premier League was conducted by the Indian Army on 20 May 17. The League was conducted for the youth of Baksa & Nalbari districts. The Premier League organised by the Army was a reiteration if it’s commitment to promote games in the rural areas of lower Assam and to scout for budding talent in the region. In the past the army has continually nurtured the youth through different means which include their skill development as also motivating them to join the armed forces through special recruitment rallies. The youth of these districts have displayed great amount of enthusiasm and talent at the Volleyball Premier League. Dhamdhama Super Kings won the Championship Trophy, beating Nalbari Pink Panthers by 3-1 in a four set final match. Cash prizes of Rs 10000 to the Champion team, Rs 6000 to the runners up team and Rs 2000 to the best player were also distributed. The event has become a standard fixture of the regional sporting calender.